Sto's popular Turbostick is now available in an ultra-lightweight, ultra-compact mini-version. Unlike more traditional cementitious adhesives, Sto TurboStick doesn’t require mixing or extended drying time. It goes on easier, cures in just two hours, and generally outperforms other adhesive systems. It is also lightweight – so no heavy lifting is required to hoist it onto scaffolding; applicators simply screw in the hose and squeeze the trigger. 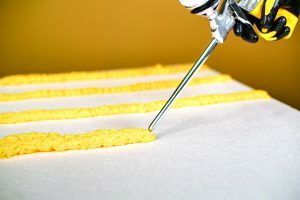 The Sto TurboStick Mini is easy to use and offers the fastest application of any adhesive, cutting the cure time from a full day to just a single hour. The Sto TurboStick Mini cartridge weighs just 26.3 oz. and covers 110 – 130 square feet of wall surface.